The Labrador Retriever, aka. Labrador or Lab is one of many types of retrievers, a breed of gun dogs. The breed of foundation of what is now the Labrador Retriever was known as the St. Johns water dog, St. John’s dog or Lesser Newfoundland. They were named after the geographic region known as “the Labrador” to distinguish them from the larger Newfoundland breed, when they were later brought to England. They were called Labrador Retrievers because they would “retrieve” from the Labrador Sea. The originators of the Labrador Retriever were actually from Newfoundland. Alternately, the Newfoundland dog was bred near the same time in Labrador. Once the breeds moved to England and the Americas, their names and origins were mixed. The Dog originally from Newfoundland became the Labrador, while the dog from Labrador became the larger, long furred dog we know and see today. The Labs are medium-large dogs with males usually weighing 65-80 lbs, and females 55-70 lbs. The males should stand 22-24 inches at the withers while females should stand 22-24 inches at the withers. They should be as long from their withers to the base of their tail, as they are from the ground to its withers. Its coat should be dense, but not wiry. Its coat is weather resistant to protect it from getting cold as it retrieves from the water during the winter, so its coat is naturally slightly dry, and oily. The acceptable colors for the Lab are black, yellow, and chocolate. His head should be broad and its eyebrows should be slightly pronounced, with its eyes being kind and expressive. The eyes are either brown or hazel and the lining around the eyes should be black. The ears set slightly above the eyes, should hang close to the head. This breeds jaws should be strong and powerful, and the muzzle should be medium in length, but should not be tapered. The jaws should slightly hand and gracefully curve back. He should have a powerful and muscular build. 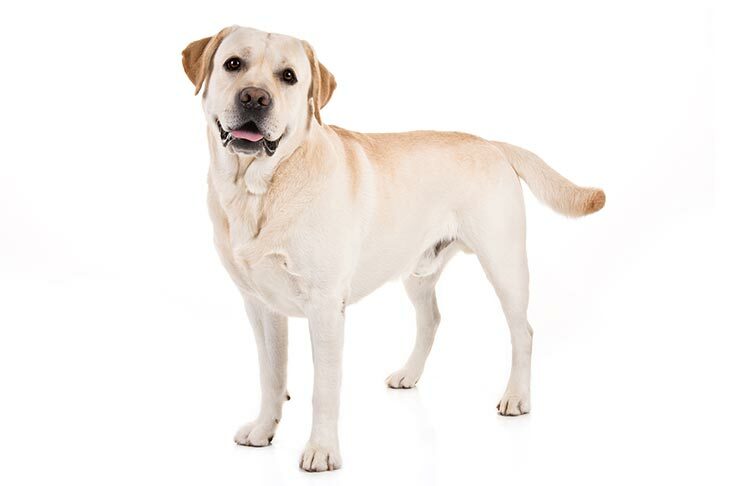 The Labrador’s temperament is described by the AKC as tractable, kind, pleasant, and outgoing in nature. Because of their keen sense of smell (which allows them to hone in on almost any scent and follow its path of origin), Navies, Military forces, and police forces use the dogs to track down terrorists, thieves, smugglers, and black marketers. They have a reputation as being very even tempered making them an excellent family dog. They are good with children of all ages as well as other animals. Because they are fun-loving, boisterous, and fearless, training and firm handling may be required to make sure it does not get out of hand. Leash training early on is recommended because of the enthusiasm to prevent them from pulling when full grown. Labs often love to play fetch with balls as well as other forms of activity. Typically the breed is not a noisy one, however they will sometimes bark at a noise, especially if it comes from a source it cannot see. Because they are a trusting breed they do not make good guard dogs. Their even-keeled temperament and their ability to learn makes them ideal for search and rescue, detection, and therapy work. The life expectancy of the breed is normally 10-12 years and is a healthy breed with relatively few major health problems. Some inherited disorders of the breed include, hip and elbow dysplasia, luxating patella, various eye problems, hereditary myopathy, deafness, autoimmune disease, and exercise induced collapse.